Son of a Tennessee sharecropper, Carl Perkins was born in 1932 and the middle son. He grew up picking cotton and got his first guitar aged 7 and it was made by his father from a cigar box, broomstick and baling wire. Carl would practice endlessly behind the chicken house pretending he was singing on Nashville's Grand Ole Opry. His boogie rhythm guitar style developed with lessons from a neighbour. He won a talent contest when he was 13 and had written a song called “Movie Magg," which a decade later would convince Sam Phillips to sign him to his Sun Records label. Carl was playing electric guitar by his teens and recruited brothers Jay ( rhythm guitar) and Clayton (string bass) to join his band. The Perkins Brothers Band quickly established itself as the hottest honky tonk band in Jackson. As soon as Carl Perkins heard Elvis on the radio, he recognized there was record producer who appreciated his type of hillbilly country. Sam Phillips gave him an audition at Sun Records Carl's singing and guitar playing attracted the famous producer. At first Carl was encouraged to record country music but once Elvis had left Sun Records, Sam pushed the rocker in Carl’s work. The band had added a drummer and now was ready with Blue Suede Shoes, a song written by Carl and borrowed stylistically from pop, country, and R&B music. When it was released in 1956 it gave Sun Records its first million-seller. Carl and the boys were traveling to New York to appear on The Perry Como Show while en route their car was in an accident leaving Jay and Carl injured. It took Carl a year to recover and being incapacitated he was unable to capitalizing on his fame. Elvis recorded Blue Suede Shoes a a follow up to Heartbreak Hotel which confirmed him at the King meantime Carl started a long struggle with alcoholism. Once recovered from his injures Carl returned to Sun studios and continued to work as a live performer. When his friend Johnny Cash left Sun to go to Columbia in 1958, Carol Perkins followed him over. The continued lack of recording success caused Carl to fall in deeper depression, fueled by his increasing dependence on alcohol and the death of his brother Jay to cancer he became disillusioned and wanted to leave show business. In 1964 he was offered a tour of England and when he met his audiences he was overcome with their devotion to his music. Temporarily swearing off the bottle Carol played to sold-out audiences and was flattered with the attention of the Beatles. All four were fans and the group had already record four of Carl Perkins songs. On return to the States a rejuvenated Carl Perkin toured with his friend Johnny Cash for the next decade. In the 1980s Carl had a new band consisting of his sons and they went on the road. In 1982 Carl dueled with Paul McCartney on the country ballad "Get It," a song from McCartney's "Tug of War." He played rhythm guitar on the McCartney-Stevie Wonder hit duet, "Ebony and Ivory." In 1985, Carol re-recorded "Blue Suede Shoes" with two members of the Stray Cats, as part of the soundtrack for the movie Porky's Revenge. In the same year he did a cable TV special in London called, "Carl Perkins and Friends: A Rockabilly Session." with George Harrison, Eric Clapton and Ringo Starr. A year later Johnny Cash, Jerry Lee Lewis, Roy Orbison and Carl Perkins reprised an informal Sun Records jam session, he, Elvis Presley, Johnny Cash and Jerry Lee Lewis had done in the 1950s. This was later released as an album, "Class of '55." Carol Perkins' last album, Go Cat Go! was released in 1996, and featured new collaborations with Paul Simon, John Fogerty, Tom Petty, and Bono. 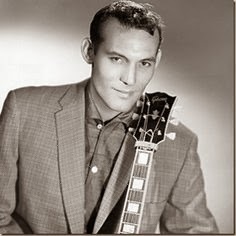 Carl Perkins died in 1998 after battling throat cancer. He was 65.